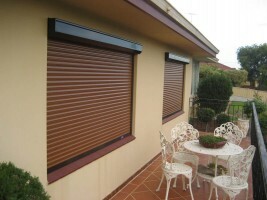 Aussie Roller Shutters are affordable and versatile aluminium blinds with numerous benefits for your home. Our roller shutters provide ultimate security and privacy to enhance your lifestyle. Energy Saving: Our roller shutters are fully insulated making your home cool in summer and warm in winter. Protection: Barrier against driving rain, hail and wind. Security: Roller shutters are a very effective visual deterrent protecting against burglary. Noise and light: Control the amount of sound and light entering your home. Stops Harmful UV: Protect your furnishings and carpets from damaging UV rays. All of our materials, including the motors are sourced from Germany, resulting in a product of the highest quality. The slats have a triple baked on enamel coating, making them highly resistant to fading. Available in eleven colours.